From high up, it is probably just a cluster of over 572 small and large emerald islands surrounded by blue waters. And really, nothing can prepare you for the stunning beauty that greets you as you set foot here. Shimmering green in the blue expanse of the Bay of Bengal, the landscape is undoubtedly scenic and picturesque. The entire stretch covered in dark forests would enhance your curiosity of the secrets lurking within. The waters are beautiful, the beaches pristine and watersports options available aplenty. These mysterious and relatively unexplored islands are presumed to be the land of Hanuman (Hindu monkey God), who is believed to have stopped here while looking for Goddess Sita. The capital Port Blair is where you'd land first and is a convenient base for exploring the entire stretch of the islands. What's more - you don't just camp under open skies, but also prepare your own quick meal of crabs and prawns right on the beach! Andaman & Nicobar Islands have the perfect ingredients for an exotic getaway - peace, cultural extravaganza, secrets of the underwater world and what not! Escape now! Moving Around: The Directorate of Shipping Services maintains regular inter-island and harbor ferry services that cater to the needs of inter-island commuters. The best way to explore the Island south of Port Blair is on a moped or motorcycle; these can be got from many of the rental shops on the Island. Also local buses, auto rickshaws, and taxis available for local transport within the islands. Permits Indians: Indian nationals do not require any special permits to visit Andamans. However, permits are required to visit Nicobar Islands, which are issued by the Deputy Commissioner, Andamans at Port Blair. Visiting the tribal areas of Andaman & Nicobar Islands is prohibited. 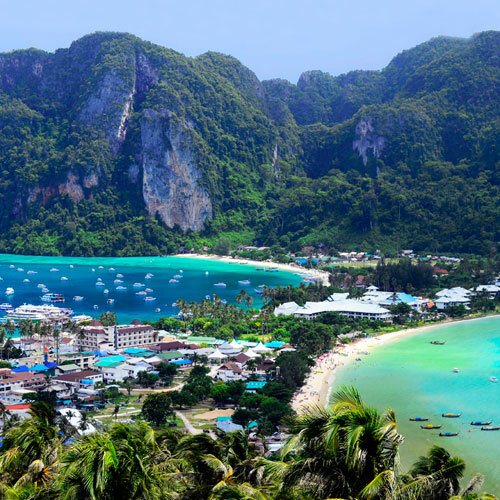 Non-Indians: Foreign tourists need a special permit to visit the Andaman Islands, which is issued for 30 days by the Indian Missions abroad or the immigration authorities in Mumbai, Kolkata, Delhi, Chennai or on arrival at Port Blair Airport. This permit is valid for the Port Blair Municipal Area, Havelock Islands, Long Island, Neil Islands, Mayabunder, Diglipur, Rangat for a period of one month where night halt is permitted. However only one day visit is allowed to places like Jolly Buoy, South Cinque, Red Skin, Mount Harriet and Madhuban. Please note that foreign nationals are not allowed at the Nicobar Islands. Port Blair: The capital city, this is where you set your foot first. Located amidst the green hillocks, it is a somewhat modern city. The attraction for tourists here is definitely the Aberdeen Market, which has everything - shops for souvenirs, major hotels, bus stand and the dock for arranging your tours of the other islands. Cellular Jail: A three-storeyed prison, the British used it to house the Indian freedom fighters. It derives its name from the fact that individual cells were constructed for solitary confinement. This landmark structure has been witness to the numerous atrocities meted out to the freedom fighters. Today a declared National Memorial, it organizes a spectacular sound and light show of the times gone by and houses within it a museum and art gallery. Corbyn's Cove Complex: A picturesque beach located near Port Blair, it sees a number of tourists flocking here for sun-bathing. It also has a tourist complex which offers a range of water sports facilities. Ross Island: Located at the mouth of Port Blair this island is covered by small creeks. One the administrative headquarters of Port Blair, today it is an uninhabited island and only has a light house, church, cemetery and tennis court as memories of the past. The forests have a natural zoo, which houses spotted deer and peacocks. This island is open to Indians and non-Indian alike and you can take the 25-minute ferry from the Phoenix Bay Jetty. Viper Island: At 3 km from the Fisheries Jetty near Port Blair, this island housed the political prisoners before Cellular Jail was built. Jolly Buoy & Red Skin Island: This is one of the best places to catch a breathtaking view of the underwater coral and marine life. Get astride on the glass bottom boats to get a closer look at the coral colonies. Red Skin Island is also ideal for coral viewing and for catching an occasional glimpse of dolphins. Both these islands are ideal for sea bathing and basking. Chidiya Tapu: Literally meaning Bird Rock, it is an enchanting beach complete with green hills and a narrow creek shaded by mangrove trees. The coral studded waters have several varieties of exotic fishes and bright birds and butterflies perch on the trees around. Visit it during sunset, when the setting sun creates a spectacle. 17 km away is Burmah Wala, where elephants are employed to carry heavy weights and tourists can watch the animals at work. Andaman Water Sports Complex: This unique complex, the first of its kind in India, has every kind of aqua sports facilities including paddle boats, row boats and water cycle, and adventure water sports including wind surfing, wind skiing, Gemini boats, Para-sailing, Sail boats, Wind-surfers, Speed boats, Glass-bottom boats and water scooter. Also constructed here is a memorial for the Battle of Aberdeen waged between the Britishers and the Andamanese natives in 1859. Sippighat: This is the site for the Sai Water Sports Complex that offers options of paddling, rowing and motor boats. It also houses the Sippighat Farm where research is carried on spices and various kinds of plants and trees, cocoÂ­nuts, cloves, cardamoms, pepper and jai fruit. Gandhi Park: Believed to have been created within 13 days, this park has within it a children's park, amusement park, deer park, water sports facilities, Japanese temple, nature walk and a restaurant. The Dilthaman tank, which was once the only source of drinking water in Port Blair is also present here. Chatham Saw Mill: Located at the north tip of Port Blair, Chatham Island houses Asia's largest saw mill. Created way back in 1836, the enormous workshops are built in padauk wood. Anthropological Museum: Created in 1975, this small museum showcases the life and belongings of the four Negroid tribes of the Andamans, who were the Jarawas, Sentinelese, Andamanese and the Onges, and two Mongoloid tribes of the Nicobars, the Nicobarese and the Shompens. Samudrika Marine Museum: This has on display over 350 species of sea-life, several rare varieties of corals and the vast riches of the enormous marine life. M.G. Marine National Park: Named after Mahatma Gandhi, this Marine National Park at Wandoor (29 km) from Port Blair is made up of open sea, creeks and 15 islands. It also has on display several kinds of coral reefs, a range of exotic coral fish and other marine life. Barren Island: Located about 135 kms from Port Blair, Barren Island is the only active volcano in India. The island has a huge crater of the volcano, which rises abruptly from the sea. No special permit is required to visit it. However, you can only view it from the boat. Cinque Island: Known for its coral-rich beach, this island is also a popular spot for swimming, scuba diving, snorkelling, fishing and camping. Havelock Island: About 38 kms from Port Blair, this is claimed to be one of the most virgin of beaches, complete with white sand and crystal waters. There are also a couple of hotels offering cottage-like accommodations to let you enjoy the beach up close! Also enjoy sessions of swimming, snorkeling, scuba diving, fishing and jungle trekking. Rangat: This village-like retreat is known for its peace and solitude. Cutbert Bay beach (20 kms away from Rangat bazaar/jetty) is a turtle nesting ground. Between December to February you can view the nesting of turtles. Diglipur: Situated in North Andaman, Diglipur provides is famous for its oranges, rice and marine life. Saddle Peak (732 meters), the highest point in the islands is closeby. Kalpong, the only river of Andaman flows from here. Enjoy a session of trekking to Saddle Peak or watch turtle nesting at the Ram Nagar Beach nearby. Neil Island: Located 36 kms from Port Blair, this island with its lush green forest and sandy beaches is ideal for a quiet retreat. The beautiful beaches at Laxmanpur, Bharatpur, Sitapur and the bridge formation on the sea-shore known as Howra Bridge are the main attractions. Long Island: An excellent sandy beach, this is one of the few places where you can view groups of dolphins. Little Andaman Islands: Another beach site, this offers the beautiful beach at Butler Bay, a waterfall and plantations of oil palms. Catch excellent views of the area from the break water at Hut Bay This is also the residence of the Onge Tribes. However entry to tribal areas is restricted. On this gorgeous island one of the best in gourmet delicacies to definitely try out is the seafood, whose vast variety would leave you spoilt! Do visit the Red Snapper located in Port Blair, one of the best places to eat on the island. The restaurant not only serves delicious seafood but Thai, Chinese and even Indian. A must try is their coconut prawn curry, an excellent dish prepared with local spices. Mandalay Restaurant at Fortune Resort - Bay Island is an open deck restaurant that serves some of the best in Indian cuisine and seafood. Head out to Islet Restaurant in Port Blair which is a two-minute walk from Aberdeen Bazaar. Islet has some tasty Chinese, as well Indian food and an open sea view of Marina Park makes it a great place for a candlelit dinner. Hotel Jaimati is known for some of the best lobster dishes. Another great open air restaurant is Waves at Corbyn's Cove beach, a perfect spot for lunch or an evening meal. The restaurant serves a delectable selection of seafood and Thai and Indian cuisine. For the best in vegetarian fare, head out to Amigos, a restaurant that serves great veg pizzas, burgers and sandwiches, and Dhanalaxmi Sea Lord for for vegetarian options. Annapurna Cafeteria is a great place to try out some South Indian snacks. For snacks and some cold beer Corbyn Cove Hut at Peerless Resort is a much recommended place. Apart from lazing around on sun drenched beaches if you feel the need to go shopping there are the amazing vibrant markets of Port Blair. The hub of all shopping extravaganzas at Port Blair is Aberdeen Bazaar. Here is where you can pick up just what you're looking for; from bamboo cane craft to coconut shell lamps and even the most beautiful jewellery made out of shells. Do get your hands on some palm mats, wooden carved furniture and colourful sarongs. You can head out to the Government Emporium that houses the Cottage Industries Emporium and Gram Khadi Commission. There's also the Andaman Handicraft Emporium and the Sagarika Government Emporium, which offers seashell articles and other souvenir items. Other shopping centers are located in Goalghar, Junglighat, Prem Nagar and Delanipur all of which are well within 3-4kms away from Aberdeen Bazaar. Owing to its cosmopolitan and multi-cultural population there are a number of fairs and festivals celebrated within. Major festivals include Durga Puja, Pongal, Panguni Uthiram, and Onam. Other important festivals are Mahashivaratri, Janmashtami, Holi, Diwali, Christmas and Good Friday. A festival that will definitely catch your eye is the Island Tourism Festival. This ten day long festival is one of the most celebrated and anticipated events of the year. Held in January it is a gala event of cultural performances by artistes both local and international. Dance groups come from surrounding islands and the mainland to perform during the festival. A not-to-be-missed event - the Andaman Dog Show. Apart from the Dog Show there is a flower show, a baby fancy dress competition and other aquatic festivities like the Floating Restaurant, the Canoe Race and Scuba Diving. Most of the hotels for Andaman & Nicobar are situated in Port Blair, since this is where you would land first. It has hotels ranging across a range of categories. Among the better known ones are Fortune Park Bay Island and Peerless Resort. These range among 5 Star and 4 Star categories and offer extremely comfortable rooms and services. Also, these are located close to the beaches, so you get a fantastic view of the region. Among other hotels are TSG Emerald View, Sinclairs Bay View, Megapode Nest and Sun Sea Resort. If you prefer staying at Havelock and exploring the neighbourings regions, Silver Sand Beach Resort, Wild Orchid and Barefoot Resort offer good value for money. Remember, tourism is steadily picking up at these locations, so book your hotel well in advance. Air: The Veer Savarkar Airport, located at Port Blair, is presently connected Chennai and Kolkata only. Currently 6 airlines operate regular flight to and fro Port Blair. Sea: Regular passenger ships ply between Port Blair and Chennai, Kolkata and Vishakhapatnam. There are three to four sailings every month from Kolkata and Chennai to Port Blair and vice-versa. There is one sailing only from Vishakhapatnam in a month. The journey takes about 50 to 60 hours and the ship normally halts at Port Blair for about two to four days. You can get more information and schedules from the respective shipping corporation offices at Mumbai, Kolkata, Chennai, Vishakhapatnam and Port Blair. Not as advertised as Andaman, but significant nevertheless, Nicobar Island are separated from the Andamans by the Ten Degree Channel. Covered almost completely in coconut palms, casuarina trees and lush greens of the forests, Great and Little Nicobar are home to the Giant Robber Crab and the rare Nicobarese Pigeon as well as the Megapode, an endangered bird species. But these are not the only things that enchant tourists all the year. It is also because these great islands house some of the extinct ancient tribes including the Sentinelese, believed to be world's only Paleolithic people alive today! Foreign nationals need a special permit to visit this 28-island cluster; even Indian nationals can't roam at will through protected and tribal areas.